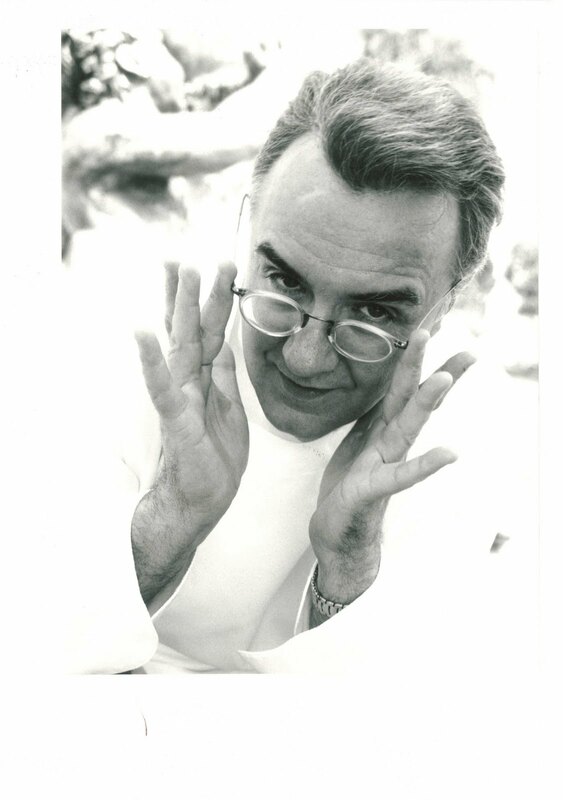 Who knew Alain Ducasse and I had so much in common? 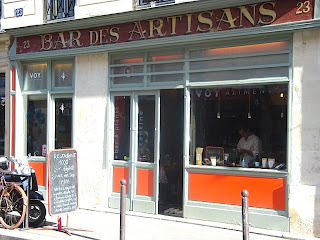 Two of his favorite Paris restaurants in his new book are Pousse-Pousse and Voy Alimento – so are mine (see below). He went to the Cannes Film Festival to cook for the opening night ceremony. 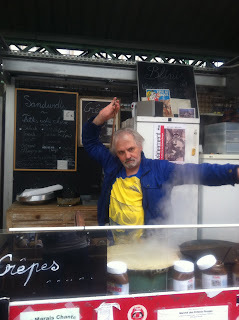 I ate what he cooked for the opening night ceremony. 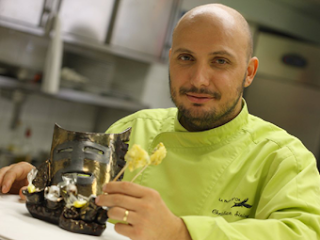 He just created the dinner for Prince Albert of Monaco’s royal wedding. I went to summer camp across the lake from Prince Albert of Monaco (though my invite to the wedding got lost in the mail apparently). He loves fresh, local produce. So do I. 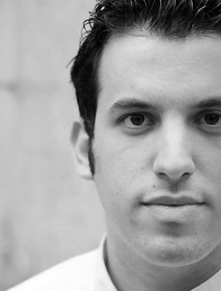 He describes himself as “impatient and loyal.” I’m as loyal – and impatient! – as they come. 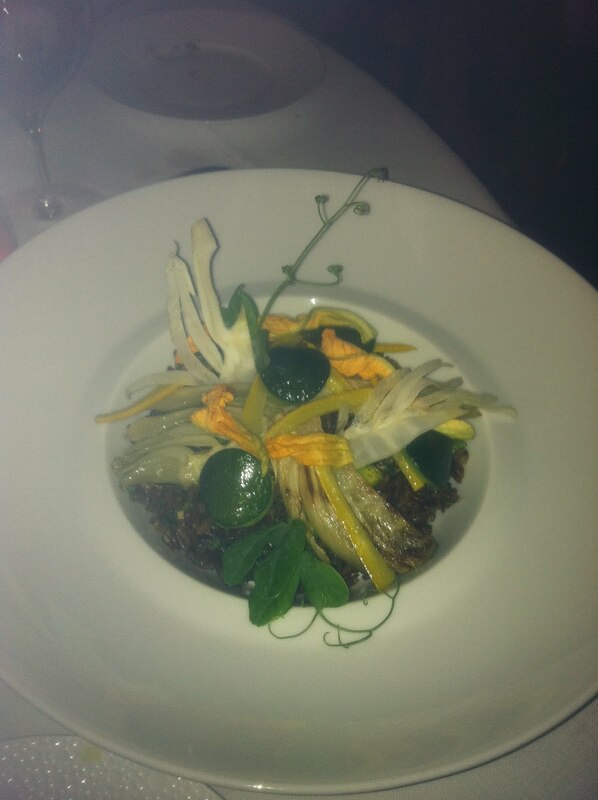 Vegetables star on his plates and he doesn’t use too much heavy cream or butter – my kind of cooking. His signature dish is the cookpot. I like to cook things in pots. He spends his time between Paris, New York and Monte-Carlo. 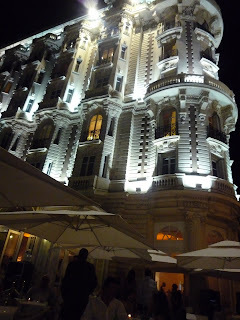 I’m a New Yorker living in Paris who attends events in Monte-Carlo 1-2 times a year. His favorite color is green. (Actually, not sure about that last one, but I’m on a roll here, why stop now?) 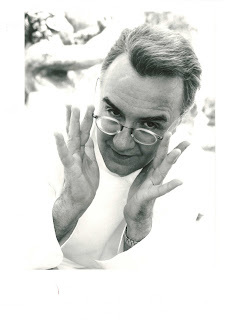 Alain Ducasse and I are culinary soul mates. It’s official. 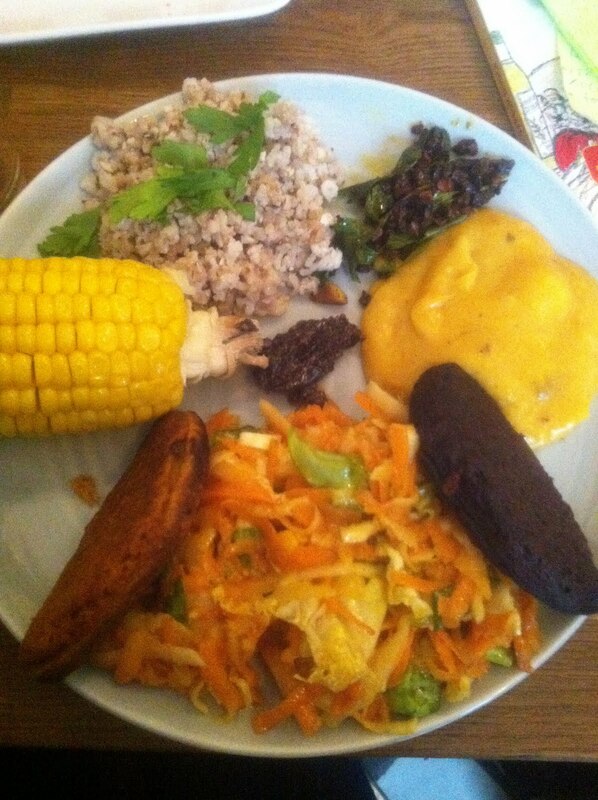 I’m madly in love with hi…s cooking. 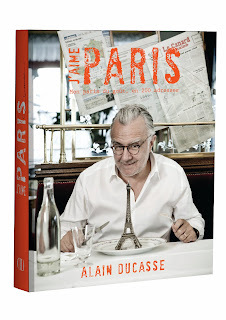 After meeting the amiable Alain in Cannes this year, I was lucky enough to have dinner at La Cour Jardin, the Ducasse-run restaurant at chic Parisian hotel the Plaza Athenée with my family. 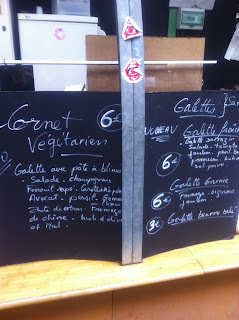 It’s my new favorite restaurant in Paris, and perhaps the world. First of all, the background scenery is gorgeous. We sat in the Plaza’s beautiful courtyard under the stars on a nice summer evening. The service is impeccable. While La Cour Jardin may indeed be the Plaza’s more “casual bistro,” the service is worthy of a 3-starred Michelin restaurant. 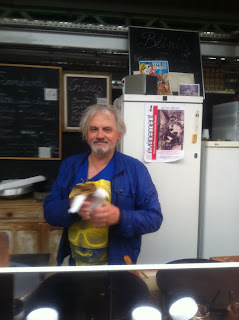 The wait staff were warm, welcoming and informative without being too obsequious. And then there’s the food. I believe that la Cour Jardin must be the fourth or fifth definition of the expression “oh là là” in the Larousse dictionary. We started with some bubblingly (yes, that’s now a word – how else can you describe delicious champagne?) luscious champagne, and I also had a freshly made beet, carrot and ginger juice with vegetables straight from Ducasse’s garden of local veggies. 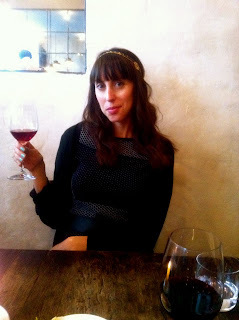 Then, the wine – a perfectly – red … I don't remember, it's all a beautiful blur, but it was quite lovely and expensive. We nibbled on foccacia dipped in olive oil, radishes with butter and a small summer soup hors d’oeuvre. 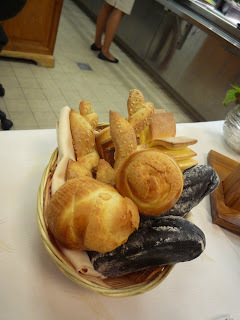 Then, the bread arrived – a housemade white bread with an assortment of seeds, crispy on the outside, airy on the inside – all that a good bread should be. As if La Cour Jardin weren’t great enough, this summer, Ducasse is sharing the spotlight with Lawrence Aboucaya, owner of Parisian café and boutique Pousse-Pousse. Aboucaya has designed a healthy, seasonal menu for la Cour Jardin this summer based on her unique and nutritious vision of cuisine. 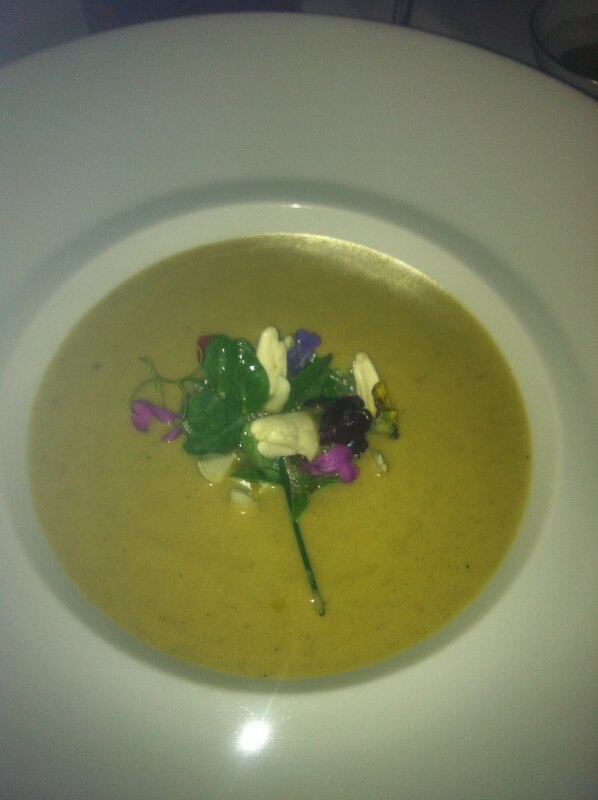 I started with Aboucaya’s “creamy” (though Aboucaya would never dare to add real cream to her vegan dishes, bien sûr) eggplant soup which arrived with an eggplant purée topped with flowers before our waitress came around to pour the creamy eggplant and almond soup into the bowl. Other appetizers enjoyed by the Lefflers included a beautifully presented lobster, a beef carpaccio and gorgeous salad of raw vegetables and edible flowers and an asparagus and morel risotto. I followed with some of the best St Pierre fish I have ever tasted, served atop a bed of “quinori” (quinoa, rice and chickpea combo) with a green sauce and seasonal vegetables. 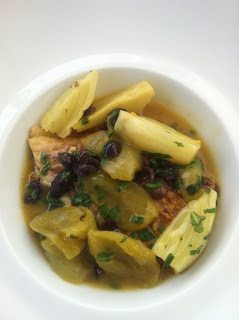 A seabass and caponata, lamb and beef also tantalized the tastebuds at the table. I ended with Aboucaya’s mélange of strawberry pistachio ice cream and raspberry pepper sorbet, served with sweet raspberry flax crackers. A cherry almond tart, strawberry and pistachio mix and a chocolate mousse were also delectable. We finished off the meal with some fresh verveine tea and aloe vera cubes – the perfect cool, refreshing end to help us digest the filling yet memorable meal we’d just devoured. It just doesn’t get any better than this. Speaking of Alains who are great in the kitchen, let’s talk about Alain Llorca. 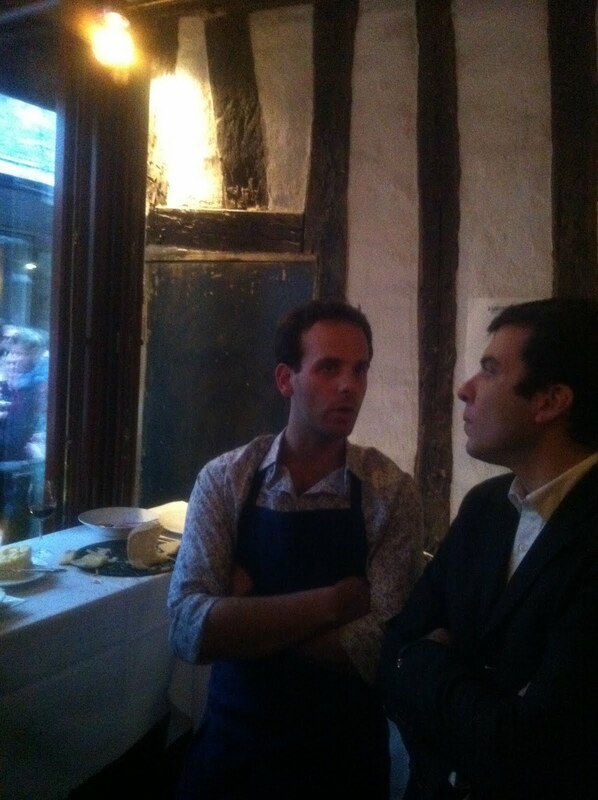 Llorca used to be the chef at the Michelin-starred Moulin des Mougins. 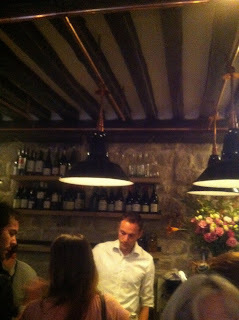 He gave up his Michelin stars and fancy schmancy surroundings to open a small hotel and restaurant in the heart of Saint Paul de Vence. I am personally very happy that he did so. The laid-back Llorca stands in his open kitchen at the center of the restaurant to greet his guests as they arrive. We sat outside with one of the loveliest views of the breathtakingly beautiful Saint Paul de Vence countryside. 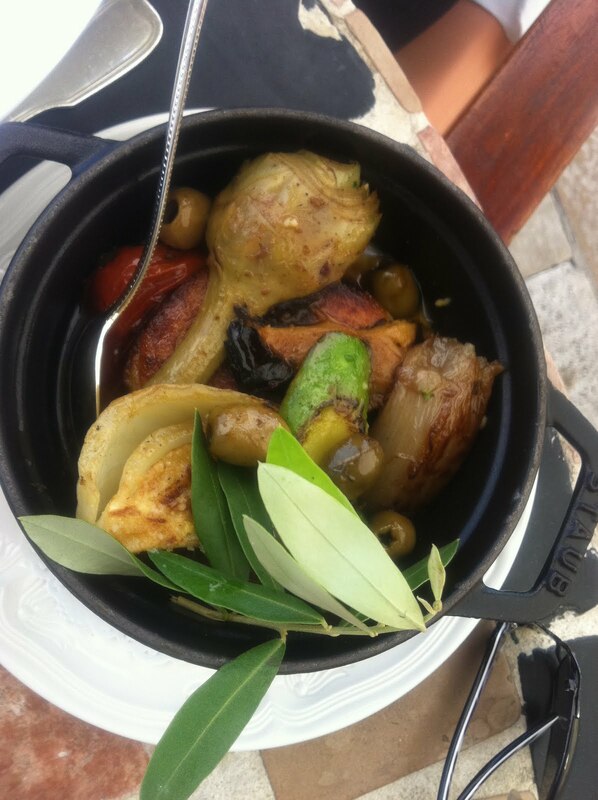 Llorca’s cuisine is rustic and flavorful, focusing on the freshest seasonal, local ingredients served simply yet elegantly. After nibbling on some radishes dipped in butter (what’s with the French and radishes with butter this time of year?) 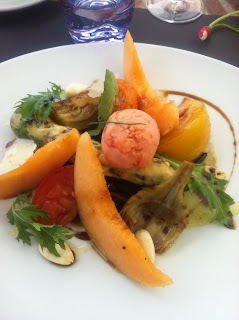 I had a beautiful salad starring fresh cantaloupe with supporting actor nods to slices of parmesan cheese, a large asparagus with mustard sauce, marinated eggplant, tomatoes, artichokes, blanched almonds, arugula, olive oil and balsamic vinaigrette and a sundried tomato sorbet that stole the spotlight. I followed with a seabass that just melted in my mouth, served with roasted fennel, incredibly flavorful olives from the region, green tomatoes and an olive-oil and green tomato-based sauce. My sister was in heaven eating her white truffle risotto and my parents enjoyed a salmon with mushrooms and potatoes and a lamb with provençal vegetables – “Like Provence on a plate!” –Mom Leffler. While Rod Stewart and other friends of Llorca from his former days at the Moulin des Mougins are frequent guests, we had our own almost-private lunch atop the hill and it was extraordinary. 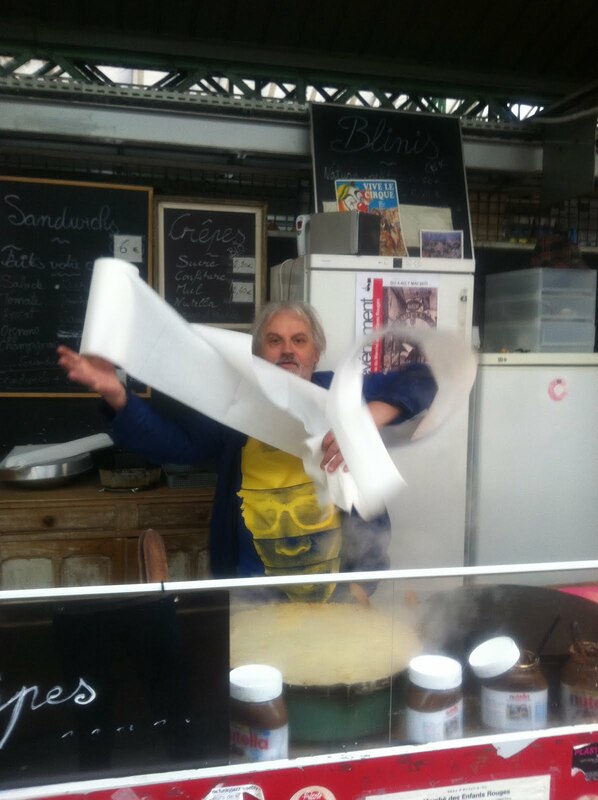 Alain the crêpe and sandwich man is a friendly, vivacious perfectionist who spends time not only choosing his mostly organic ingredients, but mixing them together with the ideal balance to please his customers. 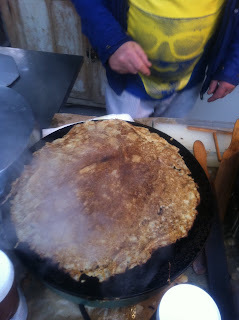 Try the “cornet végétarien,” my personal favorite – a large crêpe filled with greens, carrots, fennel, goat cheese, honey, herbs, olive oil. 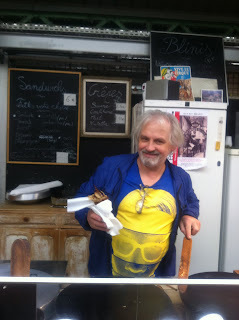 Carnivores will enjoy the fresh ham, cheese and onion version or one of Alain’s stuffed sandwiches. It’s worth the trip for the flavorful – and cheap! – crepes, but even more to get a chance to see Alain in action. 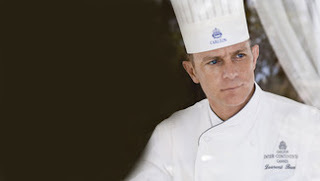 Like a fine French … uh, chef… Gregory Marchand gets better with age. Every time I go back to Frenchie, I say “prepare yourselves, tastebuds, it can’t possibly be as good as last time.” And then, it’s better. Despite his colossal global success, Marchand remains humble and Frenchie still feels like a corner, neighborhood bistro. 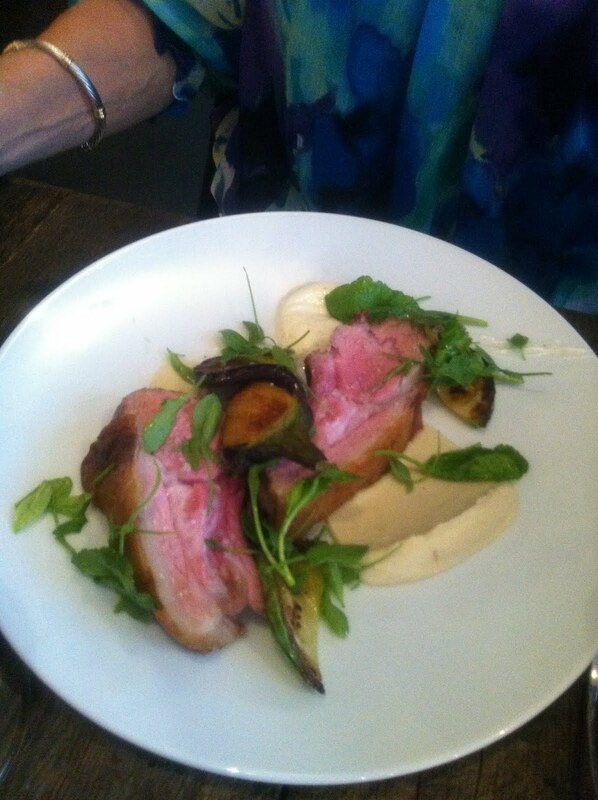 Marchand somehow manages to please all palates with his spontaneous, seasonal cuisine. 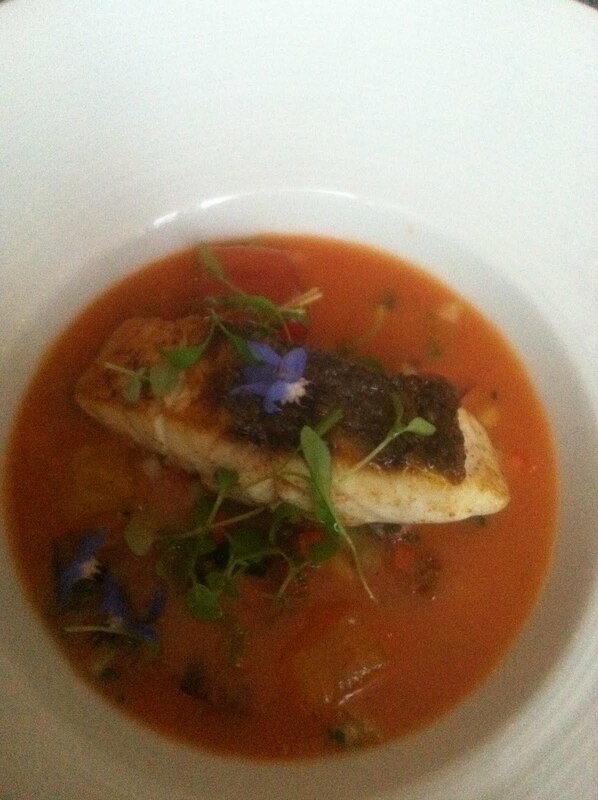 We started with smoked trout – that tasted neither smoky nor trouty – served with a cauliflower purée and shaved cauliflower, then continued with a seabass served in a tomato gazpacho with toasted croutons and chopped veggies. Mom had the cheesecake and I snuck in a panna cotta from Frenchie’s new wine bar across the street. 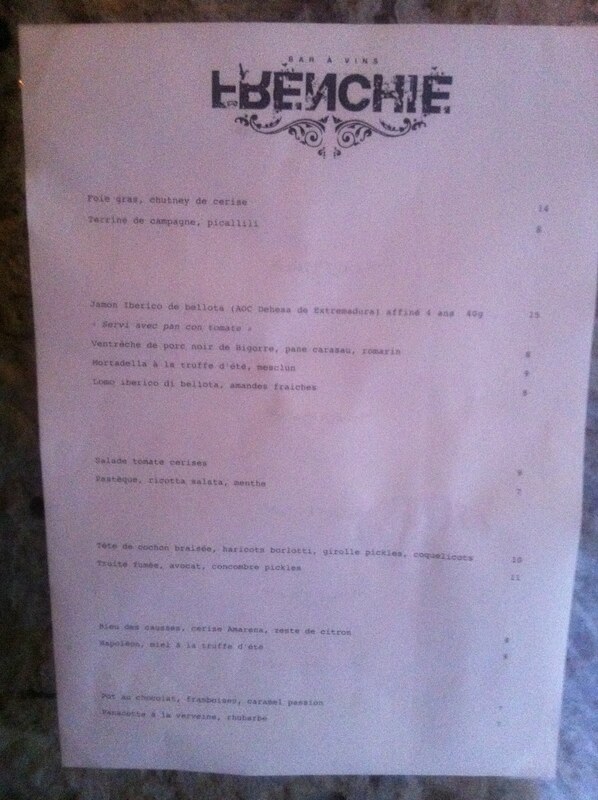 Wait a minute, you ask, new wine bar across the street? Oui, mes amis. Instead of waiting three months for a table at Frenchie (though I do recommend waiting three YEARS – it’s worth it); wait three minutes or less for a spot atop a stool at Frenchie’s new wine bar. Located just across the street, the tiny spot features a fab wine list, plus little nibble straight from Marchand’s kitchen including gourmet hams, cheeses and let’s not forget the greatest panna cotta ever. 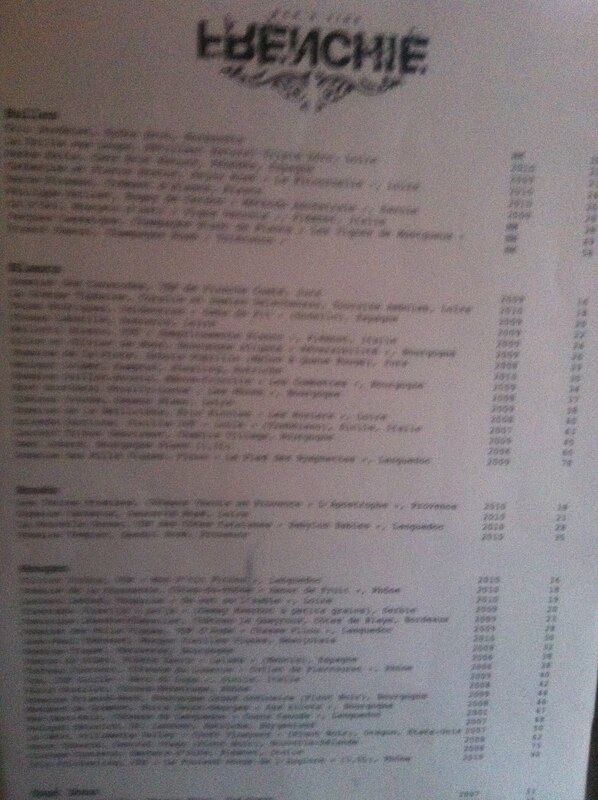 Le KGB has been my neighborhood bistro since it opened a few years ago. While it’s no longer in my neighborhood nor is it a bistro, I still love it. For those of you a bit confused and wondering why I am talking about the soviet union’s national security agency when I should be focusing on restaurants, le KGB stands for le Kitchen Galerie Bis – it’s the sister restaurant of William Ledeuil’s Michelin-starred Ze Kitchen Galerie. 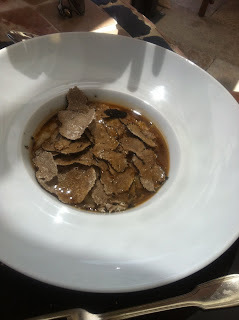 The service is impeccable, the staff friendly and the cuisine creative and delicious. Ledeuil has handed over the reigns of KGB to young chef Yariv Berrebi who makes Ledeuil’s signature Franco-Asian flavor combos come alive on the plate. Start with les “zors d’oeuvres,” mini tapas based on seasonal fare and the chef’s whims such as a vegetable bouillon, shrimp ravioli, fish tartare or lamb croquette. Follow with a creative pasta dish like lobster pasta with a “creamy” coconut milk broth, a perfectly cooked meat or fish dish such as a grilled miso mackerel with veggies in coconut milk reduction. Don’t skip the light yet flavorful desserts including a melon “cappuccino” with coconut sorbet or a pistachio strawberry rice pudding. 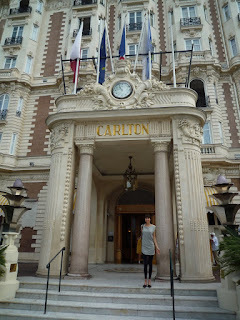 The Leffler family, aka “le bouquet de Fleurs” as we’ve now become known, enjoyed a marvelous stay at the Carlton Hotel. When I think of Cannes, I think of the Carlton hotel, the central pillar that has become the landmark midpoint of the Croisette. The hotel has managed to hold on to its traditional charm, yet modernize at the same time. Shout out to the especially notable breakfast buffet. Sure, most fancy hotels have a nice buffet breakfast, but the Carlton goes above and beyond. The hotel’s head chef Laurent Bunel and his team focus on seasonal, local fare at all meals. The breakfast buffet featured a varied assortment of fresh breads, pastries and incredibly juicy fruits, plus a hot buffet and, my favorite, an organic corner featuring an amazing organic dried fruit and seed bread, yogurts, teas and applesauces. Not to mention a side of THE SUN, with a heaping portion of friendly service from the lovely team at the Carlton. As many of you know, there are few things I love more in life than breakfast and fancy hotels and the combination at the Carlton is a dream come true. On our first night upon arrival, we were told “there’s a lobster and champagne prix fixe menu for dinner tonight, you’re our guest, I hope that’s OK.” Of course, we were appalled. Invited? Lobster? Champagne? Obviously, we were in for a hellish evening. Not only was the food delicious- chef Laurent Bunel’s attention to fresh, local fare and mélange of sauveurs is impressive- but the Carlton’s terrace on a beautiful summer night is magical. 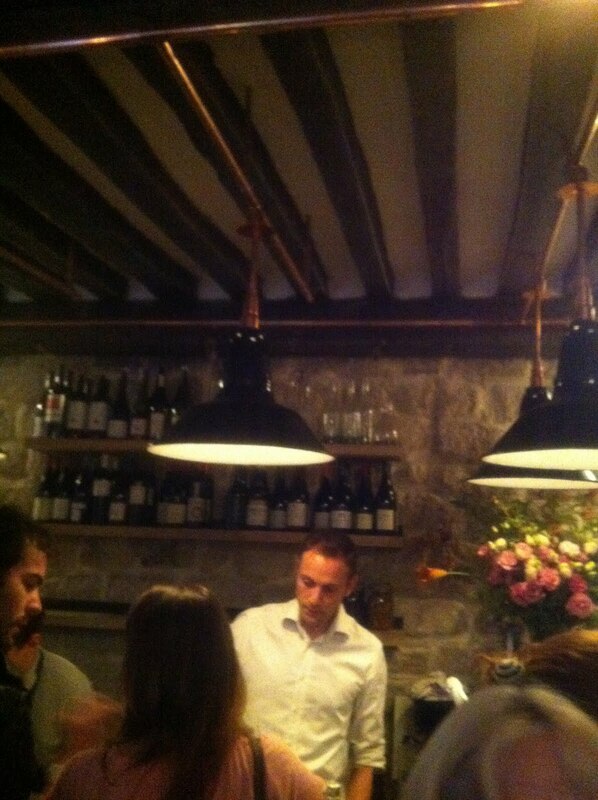 Special shout out to François, the host at the terrace at night (and now an honorary member of the Bouquet de Fleurs family). The Carlton is also currently serving up a healthy “detox” menu in partnership with a nearby clinic. 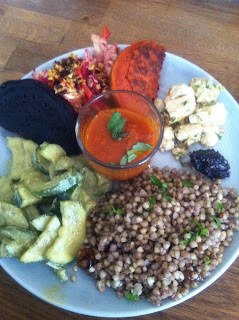 Check out the video of Bunel serving me up some healthy – yet delicious! - fare to get me back into shape at the end of this year’s exhausting Cannes Film Festival. 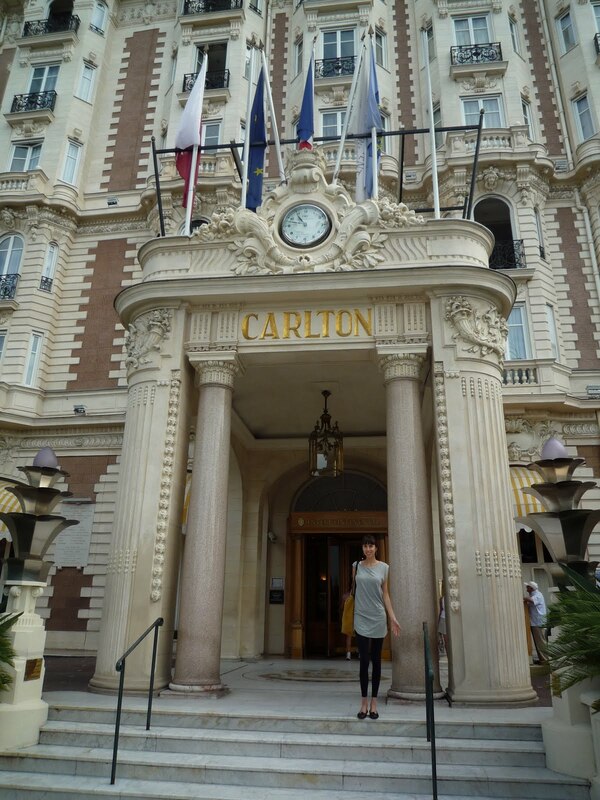 Merci to the Carlton for the most fabulous stay – and meals – ever! 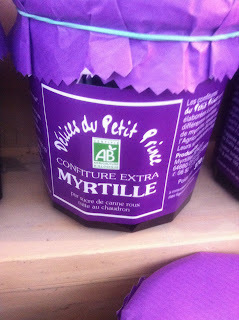 OK so he may not wear a chef’s hat and work out of a kitchen, but Monsieur Myrtille does know how to whip out a mean blueberry. 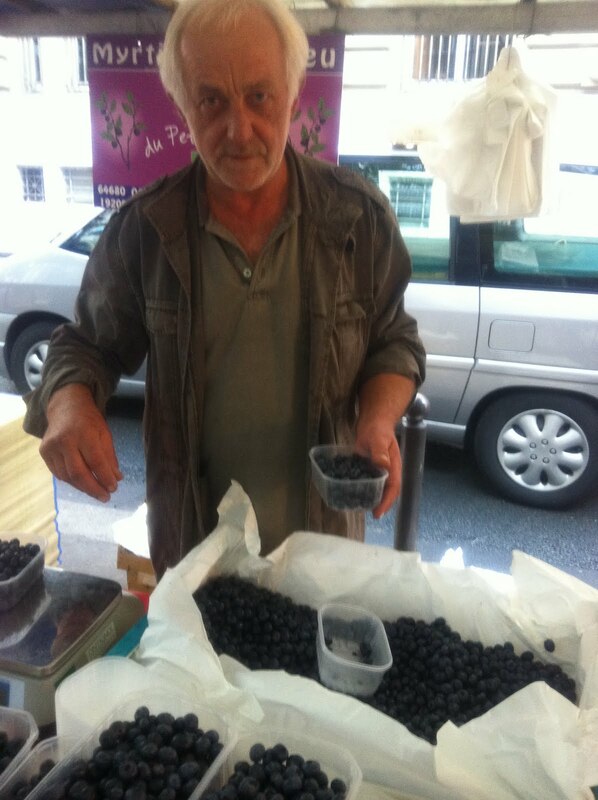 Monsieur Myrtille, aka Michel, producer of Les Délices du Petit Prince / Myrtilles d'Ogeu (Ogeu blueberries) in Saint Exupéry, sells baskets of his lovely berries at the Raspail organic market on Sundays during the summer months. The berries are plump and flavorful - the best I've ever had. 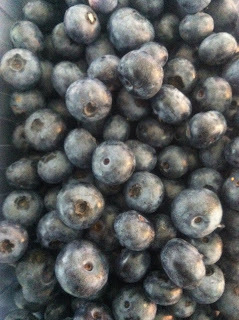 Enjoy them fresh while the weather is warm or stick them in the freezer to enjoy blueberry smoothies all year long. 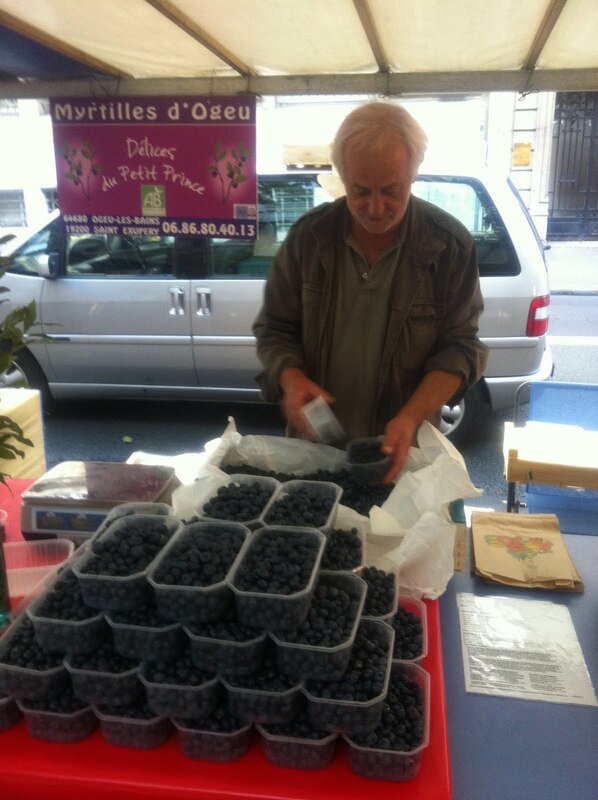 Don’t miss Michel's homemade blueberry jams, compotes and juices as well, bottled up blueberry goodness you can enjoy even after the – in my opinion, way too short – blueberry season ends. 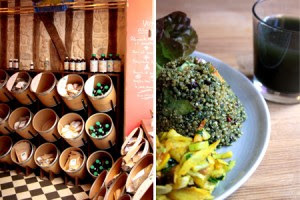 Septime has been the talk of Parisian foodies since it opened just a few months ago. 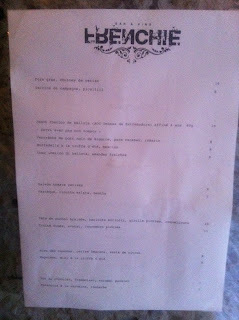 Often, when I hear so much buzz about a place, I end up being inevitably disappointed. Not so for Septime. 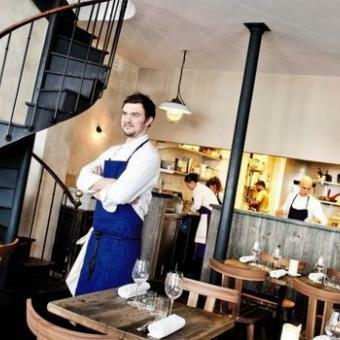 Young chef (yes, many of Paris’ new stars in the kitchen are barely teenagers) (OK I exaggerate, but just a bit) Bertrand Grébaut works from his open kitchen to cook up inspired food based on the freshest of seasonal ingredients. Choose from around three or four appetizers, main courses and desserts. 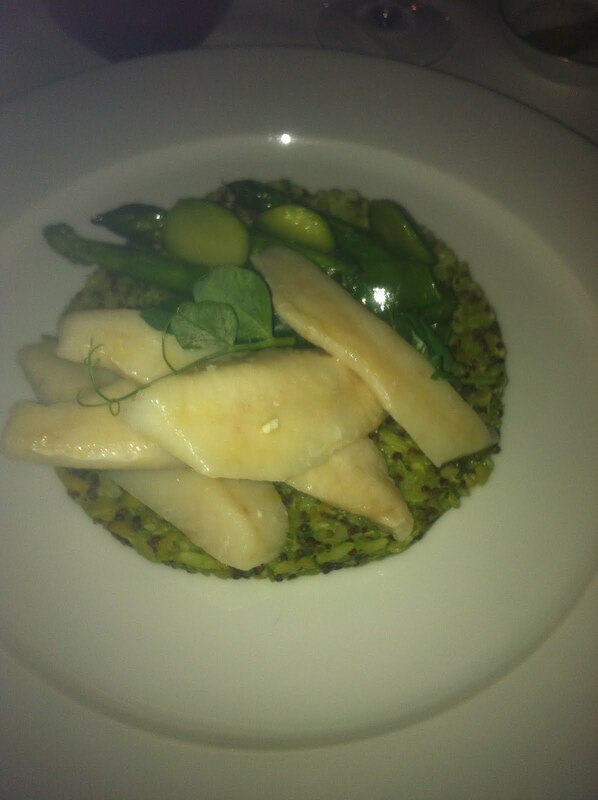 I had a strange fish I’d never heard of that I was told resembled mackerel. 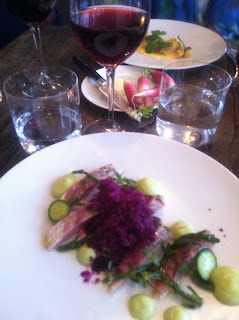 Holy Mackerel, or Holy Sort of-Mackerel!, it was amazing. The fish was served raw and marinated with salicorn seaweed, a purple herb sorbet and a cucumber sauce. 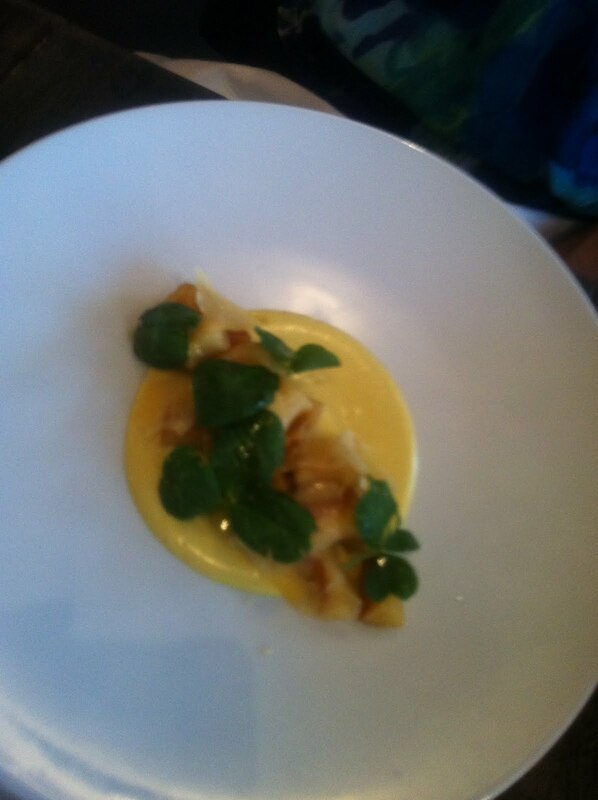 Ma mère had the gnocchi with a gouda sauce and watercress. 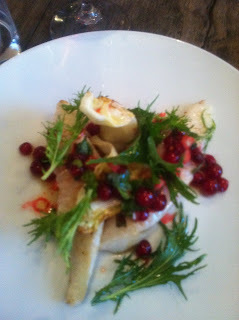 Next, I followed with a delectable monkfish with a virgin olive oil sauce, mizuna, fresh berries and sautéed fennel. Mom had the lamb with eggplant purée, zucchini and arugula. The dessert was memorable as well – buttery roasted peaches with a peach sorbet and meringues. Mom had the chocolate cake with passion fruit sorbet. I admit that I forgot the name of our wine, but I must find out because it was the lightest red wine that has every touched my lips, yet it was surprisingly bold. It was from Provence. Light and bold. Came in a bottle. Anyone? 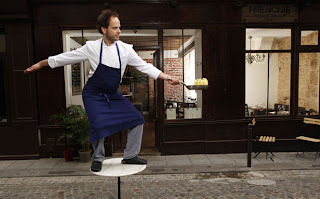 The waiters are friendly – and very good-looking may I add, I wondered if it must be a requirement to work there – and the low-key bistro feel is très French. 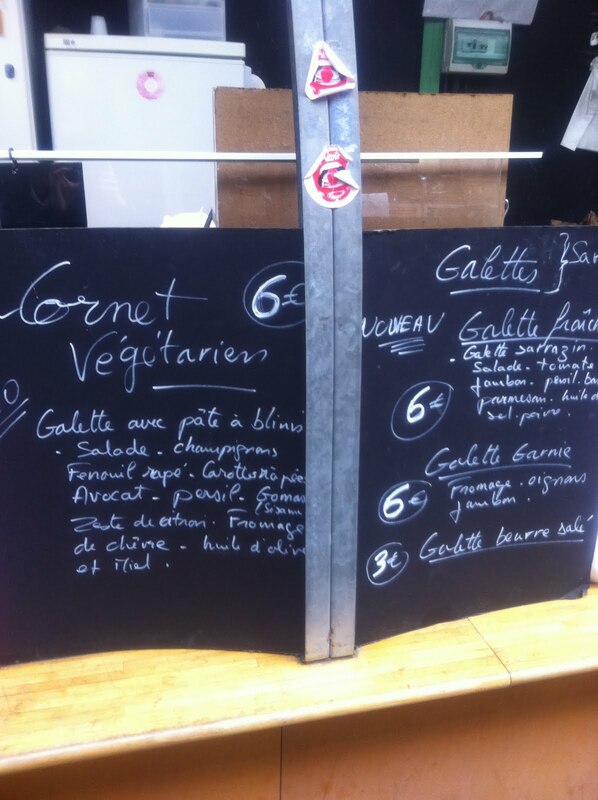 It’s traditional French bistro fare with a twist, and very light for summer as well. Definitely worth a trip … but make sure to reserve in advance. 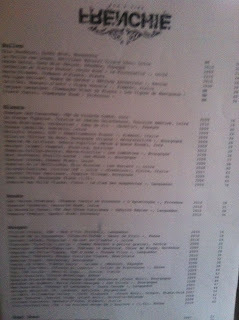 Miam, especially Septime, KGB and Frenchie! Nice choice of spots. Wow - what a selection! So many whose cuisine I would love to try! 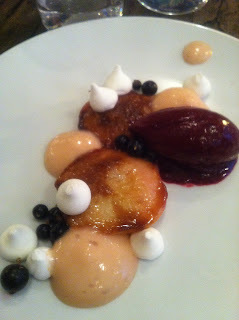 Thanks again for introducing me to Yariv Berrebi at KGB - such excellent food!